Every parent wants the best for his or her child. Safeguarding a child should be the parents’ utmost priority. For new parents, an infant car seat is one of the most important purchases. It makes sure your kids are harnessed safely to prevent serious injuries in cases of vehicular accidents. Road accidents are top killers in the United States. In fact, the National High Traffic Safety Administration (NHTSA) reports that 37,461 people died in 34,436 vehicular accidents in 2016. That’s a staggering 102 per day. Though the deaths among kids younger than 13 in vehicular accidents have declined since 1975, they still cause 1 of 4 unintentional injury deaths. Proper restraint can help reduce deaths linked to motor vehicle accidents. In the same year, 328 children under 5 years old were saved by car seats. Using the best baby car seats in the market is crucial, and if you feel overwhelmed with all the different models and brands of infant car seats, you’ve come to the perfect place. I’ve listed the best baby car seats to make the list shorter and the choices more manageable. 3. How To Install An Infant Car Seat Properly? In choosing the perfect infant car seat for your child, it’s important to consider certain factors such as price, quality materials used, age requirement, and safety features, among others. Why do you need a child safety seat? It’s an essential part of car safety and baby car seats save lives. If a baby or a child is securely strapped in a car seat, the risk of dying in a vehicular crash decreases by a whopping 71%. Also, make sure to always look for the safety mark, guaranteeing that the product can protect your kids from serious injuries during car accidents. But, choosing and buying a baby car seat can be quite daunting, especially when you’re bombarded with so many choices. It’s important to read your vehicles owner’s manual carefully before buying a baby car seat to determine where the car seat should be and how it’s installed. Remember, not all car seats fit in all vehicles. Ensure the car seat best fits your car to reduce the risk of purchasing the wrong one. The first rule in buying the ideal baby car seat is to make sure the size is compatible to the child’s weight, height, and age. Each brand of infant cart seat has specifications and usage guidelines. For instance, according to the American Academy of Pediatrics, newborns and infants, who are 2 years old and below should always use rear-facing seats. Though past guidelines have stated that children more than 12 months can use a front-facing car seat, it’s already outdated. The new guideline says that height is a more reliable indicator. The child has outgrown a rear-facing car seat when his or her head is within 1 inch of the seat top. On the other hand, children who are at least 2 years old or have surpassed the recommended weight or height capacity of the car seat, can now use forward-facing car seats. You’ll know if the child has outgrown a baby car seat if the middle of his or her head is above the seat’s top. Booster seats, however, are recommended for children who are more than 40 pounds (18 kgs). Also, kids who are more than 8 years old may use the car’s seat belt without a booster car seat. But, children should stay at the back and never in the front seat. Installing a baby car seat properly can help reduce the risk of serious injuries during a vehicular crash. A child’s safety could be in jeopardy if the infant car seat is not correctly installed. Prior to installation, ascertain that you know the car seat parts and the vehicle. Furthermore, there are different ways of installing car seats, depending on the type of baby gear you have. The first rule in installing a rear-facing baby car seat is to make sure it’s away from active airbags. Often, it’s ideal to install them at the backseat. Subsequently, ensure that it’s in a 45-degree angle. The correct recline angle is crucial, to ensure that the baby’s airway is open. As the child grows, the angle may need to be adjusted to make sure they feel comfortable. Read the user manual of the car seat for specific installation instructions. Make sure the harness straps do not fold or twist, particularly checking each time you secure your child in the car seat. You can adjust the chest clip in the harness, specifically placing them against the infant’s chest at armpit level. Every time you put your baby in the car seat, make sure to give it a tug to ensure it’s secure. Rear-facing baby car seats are generally safer than those using forward-facing baby car seats. But, if you like to use the latter, it’s important to know how to properly install the baby gear. Always check the user manual of the infant seat to make sure you’re following the requirements. Install it following the instructions in the manual. But, remember, the internal harness system is the key part of the baby car seat to keep the child properly restrained and secured. To make sure the car seat is installed properly, test it by pinching the belt. If you can pinch any of the harness webbings between the fingers, it’s too loose. But, if the fingers will slip off, the harness is properly tightened. Graco is famous for its baby gear that has been tested and proven to have the best quality there is. One of its bestsellers is the baby car seat. The newest product in this category is the Graco SnugRide 35, priced at $134. It’s a rear-facing car seat that protects infants and children weighing 4 pounds to 35 pounds. The best feature of this product is that it has a Click Connect technology that provides a secure and one-step attachment between the car seat and Graco’s strollers. A personalized travel system is a good thing for mothers who can’t carry the car seat to and from the car. Attaching it to stroller with ease is a good thing, too. You’ll feel more at ease at going around with your baby. Furthermore, this car seat is very easy to install, even moms can do it. Unlike its previous model, the SnugRide 30, the SnugRide 35 has a six recline positions and an infant body support. On Amazon, the product received a whopping 4.4 out of 5 stars from over 900 customer reviews. It’s one of the most reliable, safe, secure, and high-quality infant car seats in the market. Buying a trustworthy product from a reliable brand is recommended since the company has over seven decades of experience with baby gear manufacturing. California-based Graco company has been soaring to popularity over the past decade due to its high-quality products. To top the review of the best baby car seats in the market today is Graco’s SnugRide 30 infant car seat. 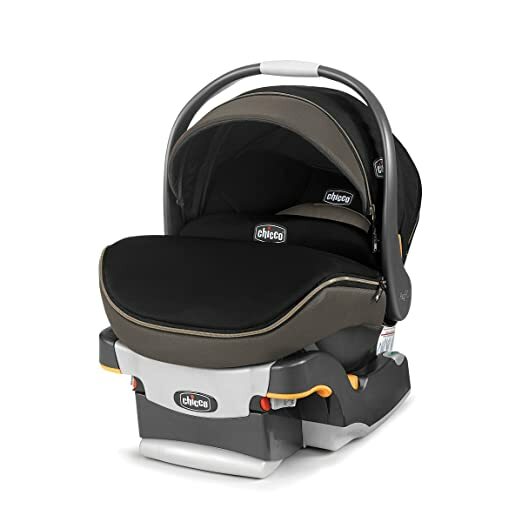 Priced at just $75, this ultra-lightweight infant car seat is a must-have for new parents. The car seat is ideal for infants up to 2 years old, weighing 4 to 30 pounds. What I like about the product is it’s easy to install and use. In fact, it has a click connect system, which is a one-step secure attachment to the company’s strollers, making a travel system. Plus, a built-in five-point harness system to ensure your baby’s safety in the car. Did you know that this ranked first on Amazon for baby car seats? Also, it has a rating of 4.5 out of 5 with over 300 customer reviews. It’s the cheapest infant car seat with the best features. To add to its popularity among parents, Graco SnugRide 30 is easy to unlatch it from the base, particularly beneficial for moms who just go their C-sections. The straps are also easy-to-adjust, even for smaller infants. If your baby is smaller than normal or born prematurely, this car seat fits all, from just babies weighing 4 pounds or less to even bigger ones, weighing about 30 pounds. Have you heard a baby car seat that transforms into a stroller? Yes, you’ve heard it right! This may be a very expensive baby car seat priced at $615, but it’s a baby car seat and stroller in one. So, the price is just right for both baby gear essentials. The ergonomically-designed car seat has wheels, which is the first one in the world. In less than five seconds, you take out your car seat and transform it into a stroller. There’s no need for a travel system with both a car seat and a stroller. There’s no need for you to bring a stroller in the car because the stroller is already there. If you’re concerned about safety, the car seat has been designed alongside engineering and medical experts, to make sure the baby’s body is properly positioned and supported with the proper ergonomic position. 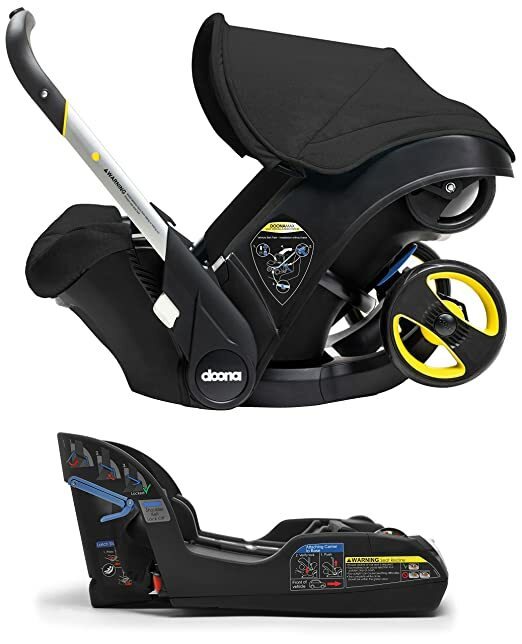 Just like other baby car seats, Doona’s infant car seat can be used for newborns weighing 4 pounds to toddlers weighing 35 pounds. It can be used for preemies when used alongside Doona’s newborn infant insert. For the protection of the baby, the car seat comes in a three-layer side impact protection, with protective sides and an anti-rebound bar crash technology. It has a 4.6 out of 5 rating from over 90 customers on Amazon. Some families have small cars and having a bulky or heavy baby car seat can be a hassle. The good news is, an infant car seat is designed for small cars with its compact and lightweight design. The Chicco KeyFit 30 Zip Air Infant Car Seat is one of the only car seats recommended for premature infants and for small cars. The car seat adjusts to an extremely small size, without sacrificing its comfort and safety features. Plus, since smaller infants may have a hard time breathing, the car seat is designed with two bubble levels to make sure it’s on the right angle, so the baby’s head won’t bow or slump. Another feature of this baby car seat is that it’s easy to install and easy to use, especially for petite parents or parents with small cars. It won’t crowd the backseat, making traveling easier and more comfortable. Just like other car seats, it can easily be connected to a Chicco stroller, making a travel system for added comfort. It also has a breathable 3D air mesh, making the baby feel comfortable. Lastly, the padded five-point safety harness can be tightened or adjusted with just one hand. For parents who want a baby car seat and stroller combo, the Evenflo Pivot Modular Travel System is the best one in the market. Priced at $280, it’s a travel system that looks elegant and at the same time, has six modes of use – travel system, frame stroller, toddler stroller, and a reversible carriage mode offering two options. Its size is just the same with other travel systems, it can accommodate infants weighing 4 pounds to 35 pounds, but the stroller maximum weight can be up to 50 pounds. 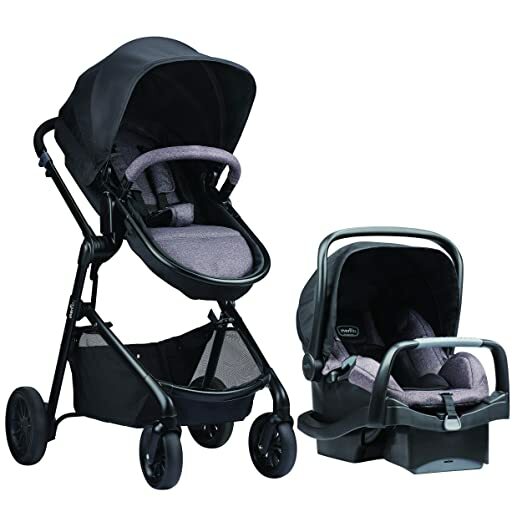 Additionally, the travel system has Cruiser Tires, giving a smooth ride for your baby. It’s lightweight, so parents don’t have a hard time pushing the stroller around. Its other features include a 3-panel canopy to protect the baby from the sun’s glare, a removable child tray, an extra large storage basket, soft but sturdy cruiser tires, and a quick “slim and fold” system, making traveling easier and hassle-free. It grows with the baby, so you’ll not worry about changing baby gears every now and then – practical and convenient. The travel system is excellent, receiving a 4.3 out of 5 starts with a staggering 418 customer reviews. Made in Italy, all Peg Perego seats are known to be safe, elegantly-designed, and with the best features. For one, its Peg Perego Primo Viaggio 4/35 infant car seat is no exception. It’s a superb car seat with 12 cute colors to choose from. Ideally for babies weighing 4 to 35 pounds, the car seat provides the best infant head support among all car seats in the market. In fact, the infant car seat has color coded belt paths to make sure that there’s proper adjustment. Plus, it has six adjustment levels to protect the infant’s head and shoulders, no matter their size. It’s an ideal car seat for smaller babies because it provides the best head support, reducing the risk of serious injuries in cases of vehicular accidents. It’s a rear-facing infant car seat with an integrated anti-rebound bar that provides extra protection if there’s a rear or front collision. Also, it helps stabilize the baby during sudden starts and stops. 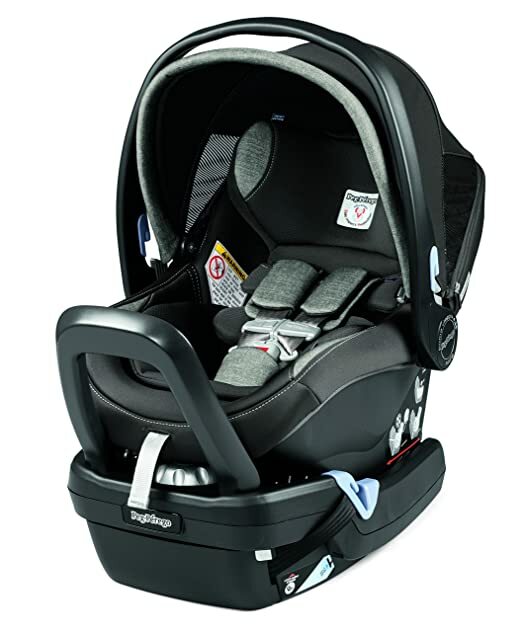 The Peg Perego car seat also has a dual stage cushion system to provide ample support on the baby’s bottom and neck, especially for smaller infants. 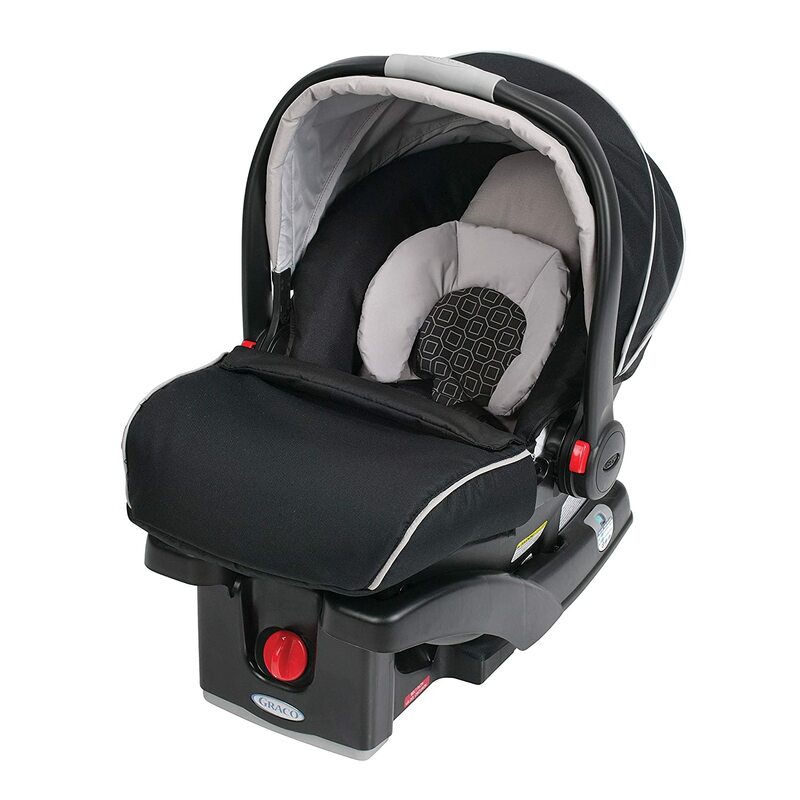 The side impact protection makes sure the infant’s head is properly positioned for east and comfort. First, it’s affordable than most car seats but it doesn’t sacrifice quality and convenience. It’s easy to install and use, plus it can protect the baby with its ergonomic design, safety features, and six recline positions. Plus, it has been rigorously tested to meet standard requirements for the safety of babies across the globe. The bottom line is, with a good price, high-quality, and convenient features, this baby car seat has gained the top spot not only in Amazon but also in my review of the best baby car seats in the market today.